The Cincinnati Reds acquisition of Sonny Gray gives them a third starting pitcher who ranks as a PB: 2-7 (top 16th to 45th percentile of all pitchers based on park and defense neutral ERA/FIPs). Their actual ERAs project to be higher because they pitch in the Great American Ballpark, which is a hitters' park, but we calculate all players in a neutral park so that when they are traded no adjustments are necessary. Gray projects to have a park neutral ERA of 3.85, just ahead of the former Dodgers' starter Alex Wood who would be No. 2 in the Reds new rotation based on the Statis-Pro cards, and Luis Castillo projects. While a PB: 2-7 is strong for a starting pitcher, teams hope for at least a couple of PB: 2-9 (top 5%) or PB: 2-8 (top 15%). The photo above is of the current Reds players with the Statis-Pro batters in black and their project park neutral OPS as a frame of reference in their suggested batting order. Numbers 21-24 are the suggested pitching rotation, while the top reliever starts with 25, and the second best is "26" etc. 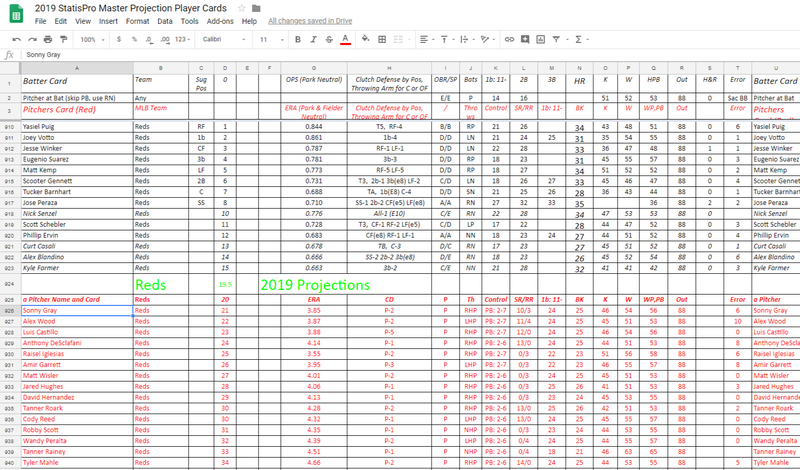 The following is the sheet of all projected players for all teams, which can be used with this link to play Statis-Pro baseball.